The Guardian did a good job! I'm curious if the name of Pedro Agramunt would surface from somewhere in relations to Azerbaijani dirty dealings. Azerbaijans ruling elite operated a secret $2.9bn (£2.2bn) scheme to pay prominent Europeans, buy luxury goods and launder money through a network of opaque British companies, an investigation by the Guardian reveals. Leaked data shows that the Azerbaijani leadership, accused of serial human rights abuses, systemic corruption and rigging elections, made more than 16,000 covert payments from 2012 to 2014. Some of this money went to politicians and journalists, as part of an international lobbying operation to deflect criticism of Azerbaijans president, Ilham Aliyev, and to promote a positive image of his oil-rich country. There is no suggestion that all the recipients were aware of the original source of the money. It arrived via a disguised route. But the revelations once again highlight the use of the lightly regulated British corporate landscape to move large sums of money around, beyond the purview of regulators and tax authorities. Seven million pounds was spent in Britain on luxury goods and private school fees. The cash, contributed by an opaque array of paymasters in Azerbaijan and Russia, travelled to the British companies all limited partnerships registered at Companies House in London via the western financial system without raising red flags. One of Europes leading banks, Danske, processed the payments via its branch office in Estonia. Danske Bank said money laundering and other illegal practices had taken place. It first noticed the irregular payments in 2014. Estonias financial regulator said systems designed to stop money laundering at the branch had failed. The scheme has been nicknamed the Azerbaijani Laundromat. Confidential banking records were leaked to the Danish newspaper Berlingske and shared with the Organized Crime and Corruption Reporting Project (OCCRP), the Guardian, and other media partners. The data covers a 30-month period. It may show the tip of an iceberg. The leaked bank records show multiple payments to several former members of the Council of Europes parliamentary assembly, Pace. One is Eduard Lintner, a German ex-MP and member of the Christian Social Union, the Bavarian sister party to Angela Merkels ruling Christian Democrats. Another is the Italian former chair of the centre-right group in Pace, Luca Volontè. The payments came at a time when Azerbaijan was under fire for arresting human rights activists and journalists, and for holding rigged elections. The regime sought to blunt criticism from Europe and the US by allegedly bribing delegates in what has been called caviar diplomacy. This intensive lobbying operation was so successful that Council of Europe members voted against a 2013 report critical of Azerbaijan. Lintner stood down as an MP in 2010, but remained a firm supporter of Azerbaijan. He founded the Society for the Promotion of German-Azerbaijani Relations in Berlin, which received 819,500 (£755,000). One 61,000 payment was made two weeks after Lintner returned to Berlin from a trip to Azerbaijan where he monitored the countrys 2013 presidential election. He said the poll was up to German standards in direct contrast to official election observers who found significant problems. Lintner says he received the money for his society, did not personally benefit, and was not an MP or Council of Europe member at the time. An Azerbaijani NGO paid for his election trip, he says. He says he has no knowledge of the original source of the payments received. Details of cash given to Volontè emerged in 2016 and caused outrage. He received more than 2m in instalments via his Italian-based Novae Terrae foundation. Prosecutors in Milan have indicted him for money laundering and corruption. Volontè denies wrongdoing. He is seeking to have the case thrown out. The data also shows money being paid via the British companies to Kalin Mitrev, a Bulgarian appointed last year to the board of the London-based European Bank for Reconstruction and Development. Mitrev received at least 425,000 for private consulting work from a local Azeri company, Avuar Co. He acknowledges the payments and says they were for legitimate business consultancy. He denies all knowledge of the conduit used to execute them or the original source of the funds. All the income, generated by activities in different countries, was duly reported and taxed in my country of residence, Bulgaria, Mitrev said. His consultancy work stopped when he joined the London bank, he said. The revelation that her husband consulted for an Azeri company might prove awkward for Mitrevs wife, Irina Bokova, who is the director general of Unesco. Bokova has bestowed one of Unescos highest honours, the Mozart Medal on Azerbaijans first lady and vice-president, Mehriban Aliyeva. She also hosted a photo exhibition at Unescos headquarters in Paris, entitled Azerbaijan A Land of Tolerance. The Heydar Aliyev foundation organized the event. Asked by the Guardian whether there was a conflict between her husbands work and her UN role, she strongly denied this, saying she had no knowledge of her husbands business affairs. As a director general of a UN agency, my duty is to develop sound working relations with all members of the organisation in conformity with the policies set by member states. Azerbaijan is not an exception in this respect. I am immensely proud of my determined pursuit of the mandate of Unesco, including in the area of human rights, freedom of expression and the safety of journalists. Large sums from the scheme were spent on lobbying. In 2014 Eckart Sager, a former CNN producer based in London, received nearly 2m from the British companies. His PR company is linked to articles that promote the Azerbaijani government and its views. One piece denies wrongdoing by Baku in the Volontè case. Sager did not comment. Another beneficiary is a London-based Azeri, Jovdat Guliyev, who received 25 payments totalling almost £400,000. Guliyev is a member of the Anglo-Azerbaijani Society, a lobby group co-chaired by the Liberal Democrat peer Lord German. Guliyev did not respond to repeated messages asking him for a comment. The four firms at the centre of the Azerbaijani Laundromat were all limited partnerships registered in the UK. They were: Metastar Invest, based at a service address in Birmingham; Hilux Services and Polux Management, set up in Glasgow; and LCM Alliance, from Potters Bar, Hertfordshire. Their corporate partners are anonymous tax haven entities based in the British Virgin Islands, Seychelles and Belize. L Burke Files, an international financial investigator, said these company structures were purposefully opaque. Foreign criminals used Scottish limited partnerships, or SLPs, he said. In June the government announced SLPs would have to name their significant owners, or pay fines, amid evidence of growing fraud. No one suspects Scotland. Its never been on the Financial Action Task Force (FATF) list of non-compliant countries, Files said. If you are going to launder money its probably best not to run it between Russia, Malta and the Cayman Islands. Does Scotland raise a red flag in your mind? No. All four British companies are named as payment channels in the Italian prosecution case against Volontè. They have since been dissolved. The banking data shows that the Azerbaijani fund was used for a wide variety of purposes. More than $2.9bn went to companies, with about $50m paid out to individuals. Many beneficiaries were retail and service firms in western Europe. In all probability, they would have been unaware of the origins of the payments they were receiving. Some of the 200 money transfers to the UK concerned education. In 2014 £89,800 was transferred to Queen Ethelburgas Collegiate, a private boarding school in York. The school would not identify the pupil or pupils involved or comment. There were payments to the tuition college Bellerbys and to the ICS international school in London. Bellerbys said it was investigating. The data suggests there were a number of relatively modest bursaries to regime-connected Azerbaijani students studying in Britain, as well as rental deposits on upmarket London flats. Other purchases included designer dresses, luxury cars and legal fees. There is no suggestion the UK recipients should have known about the provenance of the money. Azerbaijans ruling family is not directly named. But the evidence of a connection is overwhelming. Large sums come via the state-owned International Bank of Azerbaijan. This is the largest bank in an oil-wealthy country, and yet earlier this summer it filed for bankruptcy protection in New York. The defence and emergency situations ministries in Baku all chip in cash. The scheme was used to pay for the governments incidental expenses including the medical bills of Yaqub Eyyubov, Azerbaijans first deputy prime minister. There were separate payments to Eyyubovs son Emin, Azerbaijans EU ambassador, and to the presidents press secretary, Azer Gasimov. Business partners of the US president, Donald Trump, in a project to build a luxury Trump Tower in Baku also appear in the Laundromat scheme. The hotels local developer was Anar Mammadov, the billionaire son of Azerbaijans ex-transport minister Ziya Mammadov. At the time the scheme operated, the Mammadovs were one of the countrys most powerful and wealthy families. The Mammadovs Baghlan holding company is linked to Laundromat transactions. In 2012 the Trump Organisation signed a deal with the Mammadovs to build a 33-floor, 130-metre-high ultra-modern skyscraper. In October 2014 Ivanka Trump toured Trump Tower Baku, posting photos of the unfinished building on her Instagram account. The hotel never opened. Trump has since cut his connection with the project. The Laundromat scheme does not link to Trump but raises questions about his choice of business partners. It is not entirely clear where the money used in the scheme comes from. The Russian government paid $29.4m into the Laundromat via its main weapons company, Rosoboronexport. Several transactions link to another $20bn money-laundering scheme, which operated out of Moscow between 2010 and 2014. The scheme, the Global Laundromat, was exposed in March by the OCCRP, Novaya Gazeta and the Guardian. A mysterious private firm in Baku, Baktelekom MMC, pays in more than $1.4bn. The firm is what fraud experts call a doppelganger entity. It sounds like the state telecoms firm with the same name but bears no relation to it. It doesnt have a website. Its function is unclear. According to the OCCRP, Baktelekom MMC is linked to Mehriban Aliyeva. In January the company was let off a $17.4m tax bill. The Danish bank Danske said it had not been good enough at monitoring suspicious transactions at its Estonian branch. The bank has since tightened procedures and controls and terminated relationships with some customers. We will not accept Danske being exploited for money laundering or other criminal purposes. We will do everything to prevent it from happening again, it said. Madis Reimand, the head of Estonias financial intelligence unit, said his office had come across the suspicious Azerbaijani cash flows in 2013 while analysing a separate case. From there we followed the tracks, he said. We tried to cooperate with the source country in order to ascertain where the money came from. This, however, didnt work out. Reimand said Estonias financial supervisory authority had identified what had gone wrong and taken steps to prevent similar fraud in the future. we have a small favour to ask. More people are reading the Guardian than ever but advertising revenues across the media are falling fast. And unlike many news organisations, we havent put up a paywall we want to keep our journalism as open as we can. So you can see why we need to ask for your help. The Guardians independent, investigative journalism takes a lot of time, money and hard work to produce. But we do it because we believe our perspective matters because it might well be your perspective, too. I appreciate there not being a paywall: it is more democratic for the media to be available for all and not a commodity to be purchased by a few. Im happy to make a contribution so others with less means still have access to information. Open fraud and no one talks about it or cares, why? Maybe they are in on it!!!!!!!!!!!!!!!! So called democracy and transparency. This is what all that money buys! So called free worlds corrupt conscience and it's silence to crime. Azerbaijan continues the arms race in the region, expanding the types and markets of the purchased weapons, Armenian Deputy Defense Minister Artak Zakaryan stated at a conference titled “Military-political tactic of the adversary and our challenges” underway in Yerevan. In Zakaryan’s words, Azerbaijani acquisition of large amount of weapons speaks of the country’s intention to solve the [Karabakh] conflict through military means. “Since 2013, Azerbaijan has been consistently escalating the situation across the Line of Contact [between Nagorno Karabakh and Azerbaijan] as well as at the Armenian-Azerbaijani state border. Armenia’s appeals to the international community over the matter, the OSCE Minsk Group in particular, have largely remained unanswered,” the deputy minister stressed, while presenting a report over the situation of border clashes between Armenian and Azerbaijani forces and the current strategy of the military potential development of the Armenian forces. “The military actions unleashed in April 2016 were unprecedented not only in nterms of being the first since the 1994 ceasefire, but also for the first Karabakh war, considering number of factors, including the fire intensity across the whole Line of Contact, the applied weapons and military equipment, the scale of involved forces and military hardware. In the occurred reality Armenia has adopted a policy of suppressing and containing the adversary’s large-scale offence on the frontline,” added the deputy minister. “In fact, this is nothing more than a trial against Azerbaijan – of course, figuratively, not in a legal sense,” Armenia’s Deputy Foreign Minister Shavarsh Kocharyan told reporters at a briefing on Wednesday, commenting on the fresh corruption scandal around Azerbaijan’s ruling elite, which operated a secret $2.9bn (£2.2bn) scheme to pay prominent Europeans, buy luxury goods and launder money through a network of opaque British companies. The deputy FM noted that what is happening today throughout Europe – investigations, criminal proceedings – come to prove that Europe has already run out of patience. “People are weak: even MPs, officials in the heart of Europe cannot resist this temptation. There is a very interesting pattern here: these are those lawmakers whose term in office expires soon and they cannot regain it anymore. Anyways, it is a disgrace, a slap to entire Europe,” the official noted. According to him, it is no accident that Azerbaijan’s response is the same – the Armenians have done it. “Whatever happens, they put the blame on Armenians,” Mr. Kocharyan highlighted. “They say the Aliyev family has nothing to do with it. Meantime they do not deny that all of this has happened. This is noted in their official response. This means in that state, where everything is controlled, $3bn was taken out without their knowledge, which is absurd in itself,” the deputy FM said. European politicians and make luxury purchases. must present its first report in December. been involved in this corruption scheme”, Zohrabyan said. rid of Aliyev’s high-ranking puppet lobbyists”, she said. This was an open secret that many knew about it, but willfully ignored it due to politics and interests. I don't believe anything substantive will come out of this fake investigations. British companies in the matter, the Guardian reports. offshore bank balances of plutocrats and criminals here and abroad”. another accusation of illicit operations of the Aliyev family. Azerbaijan directly accused the Guardian, and the Armenian Diaspora. intelligence, the Armenian Diaspora and the US”. Armenian lobbyists for the revelations. accusations”, the Azeri officials said. The money was allegedly channelled through four UK-based opaque companies. a favourable attitude to the government. original source of the money, it added. and Corruption Reporting Project (OCCRP). Transparency International, the global anti-corruption organisation, is calling for politicians, banks and businesses that helped to launder the reputation of Azerbaijan across Europe to be investigated and, if appropriate, for the perpetrators to be sanctioned. The anti-corruption organisation will launch national and international advocacy campaigns targeted at strengthening anti-money laundering practices, identifying individual wrong-doing and calling for international organisations, including the Council of Europe, to investigate allegations of inappropriate behaviour and take corrective action. This follows an investigation carried out by journalists in six countries (Czech Republic, Denmark, France, Germany, United Kingdom and United States) into a shady financial network that appears to have funnelled money from a US$2.9 billion Azeri slush fund to pay decision-makers and prominent individuals across Europe. “It is shocking to see that some politicians at respected bodies like the Parliamentary Assembly of the Council of Europe are up for sale and are willing to turn a blind eye to corruption and human rights abuses for cash. They must be sanctioned and we will put pressure on the authorities to take action. The story does not end here,” said José Ugaz, Chair of Transparency International. The investigation names, Danske Bank, a prominent bank in Denmark and specifically its branch in Estonia as the centre of the financial network. It also identifies four shell companies set up in the UK with secret offshore owners that received money from the slush fund. In addition, individuals and businesses are reported to have received payments from these companies in Germany and the UK. The reports describe how politicians and consultants who received the money were in a position to influence decisions about Azerbaijan’s human rights record at the Parliamentary Assembly of the Council of Europe (PACE). The purpose of the payments appears to have been to limit the effects of damaging information regarding human rights and election fraud that would have brought the country into greater disrepute. “These investigations show that even in countries where corruption risks are considered low like Denmark, which ranks at the top of Transparency International’s Corruption Perceptions Index, the regulatory bodies are still behind in enforce anti-money laundering legislation,” added Ugaz. Transparency International, as part of a partnership with the Organised Crime and Corruption Reporting Project that broke the story, will pressure the appropriate authorities to ensure that any wrongdoing is both investigated and punished, and that regulatory loopholes are closed. Provide a dossier relating to the investigation with the US authorities since the International Bank of Azerbaijan is based in the United States. The slush fund also supported the lavish lifestyles of the ruling family of Azerbaijan and a crony network of accomplices, including business leaders and politicians both in Germany and elsewhere. The investigations uncovered that the money was used to buy a football club, jewellery and major real estate in the Czech Republic. Ask citizens across Europe to write to their parliamentarians who attend the Parliamentary Assembly of the Council of Europe to adopt stronger integrity standards in light of serious allegations of corruption and manipulation. The Council of Europe is the leading forum in Europe tasked with monitoring human rights, democracy and the rule of law in its 47 member states. In a series of new investigations, a network of investigative journalists have discovered the government of Azerbaijan was the driving force behind a $2.9 billion secret slush fund that may have helped it pay off European politicians. The Azerbaijani Laundromat is the name given to a complex money-laundering operation that handled US$ 2.9 billion over a two-year period thanks to four shell companies registered in the United Kingdom. Between 2012 and 2014, Azerbaijan’s kleptocratic ruling elites pumped the money through the companies’ Estonian bank accounts. The companies’ true owners were hidden behind unknown offshore shareholders. The money transfers made into the accounts of politicians in Europe may have helped persuade the Parliamentary Assembly of the Council of Europe (PACE) to vote against a critical report of Azerbaijan in 2013 calling for an adoption of the resolution on political prisoners, although that has not been proven. Money-laundering operations like the Laundromat are common in the former Soviet republics and are often deeply integrated into their economies. They may be used by government officials, organized crime groups, or even ordinary businesses for purposes such as disguising the origins of money, evading taxes or sanctions, paying bribes, bypassing customs fees, moving funds to Europe or other markets, or embezzling funds. The Azerbaijani operation, too, was likely designed primarily to obscure the origin and destination of dirty money. It was also used as a slush fund to pay off people (both inside and outside the country) who served the interests of the political elite in Baku; to buy luxury goods; or to move money abroad for various purposes. [Azerbaijan] used the slush fund to buy silence and praise from influential European figures during a time when the government in Baku threw around 90 activists, journalists and opposition politicians into prison on politically motivated charges. Following the release of the OCCRP investigation patriotic trolls stormed online to accuse journalists of spreading unverified information and maintaining ties to an ill-defined “Armenian lobby”. The patriotic trolls used the same texts when commenting under the OCCRP story shared on Facebook. The positions of the trolls were mirrored almost exactly by Azerbaijani officials, blocked access to OCCRP's website for good measure. The Soros-hatred makes sense in so far as billionaire philanthropist George Soros’ Open Society Foundation has provided grant money to OCCRP in the past. But Hajiyev might have asked the president's media department to remove this picture from its page before embarking on a full-scale offensive. While Azerbaijani authorities were busy refuting any connections with the reports, movers and shakers in Brussels demanded investigations into the deeds of the leaders and politicians named in the investigations. Moreover, Bulgaria's state prosecutor ordered an investigation into new information about payments made by Azerbaijani companies into the accounts of Kalin Mitrev, the country's representative on the board of directors of the European Bank for Reconstruction and Development. OCCRP published a comprehensive list of reactions to the project's findings on September 8. Given that corruption provides the basis for the Azerbaijani state and has infested its international relations with the West it is unsurprising that journalists and organisations that draw attention to this problem face serious hurdles and even imprisonment. Khadija Ismailova, one of the main investigators in the laundromat series, was sentenced to over seven-and-a-half years in prison on trumped up charges in 2015. Although she was releasedthe following year after one-and-a-half years’ jail time in total, the charges against her were not dropped. Transparency International, perhaps the world's most famous anti-corruption body announced just this month that its Baku office was closing down due to restrictive laws put in place to prevent locally-based civic organisations receiving funding from abroad. It remains to be seen whether European policymakers will impose similar restrictions on dirty money coming from a certain oil-rich, ex-Soviet state in the South Caucasus. It's ironic that so called European democracies are quick to label small countries corrupt, and give non ending lessons how to be just and European yet they ignore their true colours like a smelly fish. Non of the big news corporations talks about it, silence in this case is not golden! longest-established company formation agencies, investigators claim. investigation sending shock waves through Europe. trace its roots back to Victorian times. activities or links to the former Soviet republic. to pay off western politicians. people suffered from laundering of this kind. damaging it is to be complicit in global corruption." firms made up a core that distributed the cash from Azerbaijan. core firms to Rasmus between June 2013 and December 2014.
registered in the British Virgin Islands. especially in the former Soviet Union. mailbox and virtual offices in Glasgow and Edinburgh. The Herald asked Jordans to comment but we have received no response. president of the Edinburgh City Business Club. Russia. A man has been jailed. rather like Istanbul in Turkey, that somehow bridges two worlds. Communist party, accused him of corruption. not first yield to harassment, beatings, blackmail, or bribes." something of a bogeyman for some former Soviet regimes. Organised Crime and Corruption Reporting Project. thanks to a deal with an Azeri named in the Laundromat. whose website has been blocked in Azerbaijan, "the lapdogs of Soros". Also to blame for the stories, said Azeri sources, were the Armenians. dispute which has still not been resolved. Oh, and MI6. Russia, the EU and Middle Eastern neighbours. Baku is not the only bridge from East to West. So, it seems, is Scotland. One of the main topics of the fall session of the Parliamentary Assembly of the Council of Europe (PACE), to be launched in Strasbourg on October 9, will be the report on Azerbaijan’s obligations. Recently the PACE Monitoring Committee has confirmed that report in Paris. During the discussion at the Commission meeting, some formulations in the document were toughened. “Aravot” asked Hermine Naghdalyan, a member of the Armenian delegation to the PACE Monitoring Committee, whether what toughening and new provisions are included in the report in particular, Mrs. Naghdalyan said: “The commitments undertaken by Azerbaijan, as a country under monitoring, are spoken about in the report presented by co-rapporteurs Austrian Stefan Schennach and Romanian Cezar-Florin Preda. There were also controversial opinions. Perhaps the most important thing is as Dutch delegate Tony Cox said that these are the obligations and commitments that every country voluntarily assumes when joining the Council of Europe. However, their fulfilment, according to the delegate, remained in the form of a dream in case of Azerbaijan”. According to Hermine Naghdalyan, the report is quite critical, although there were also opinions that the ideas are quite softly and diplomatically expressed in the report. The report touches upon the problems in Azerbaijan in almost all spheres: the problem of separating power wings, Parliament’s role, accountability of the executive power, which is at a fairly low level, the justice system, which is far from being independent and impartial, independence of judicial bodies, implementation of European Court judgments, arbitrary use of criminal law as a means of limiting the disagreement of opinions. All the pressures that exist in the mass media are presented in detail. Let us also note that in one week the co-rapporteurs will again visit Azerbaijan, after which the report will be supplemented, which will be put to a vote in the October session. Mrs. Naghdalyan stated that the memorandum of the report, the documentary materials received by the rapporteurs, has been prepared much more comprehensively this time, it is full of serious documentary materials. But there were also claims to include the names of human rights defenders and journalists who were subjected to pressure in the resolution. Let us also inform that before the PACE autumn session, another criticizing report against Azerbaijan is presented in the Legal Affairs Committee. It is titled “Presidency of Azerbaijan. What are the consequences?”. According to Mrs. Naghdalyan, dissatisfaction with Azerbaijan was still in the year of its presidency – 2.5 years ago, when a question arose, whether how such a country could take over the presidency. But, according to the order, Azerbaijan was given that opportunity, and also a timely decision was made to give Azerbaijan one year after its presidency to make all those changes. At that time, there was an initiative to prepare another report on Azerbaijan. Mrs. Naghdalyan said that the discussion of this report was deliberately delayed, and now two reports are presented simultaneously. This report also points out the corrupt practices in Azerbaijan. At the end of the conversation Mrs. Naghdalyan also mentioned that in both reports there is a provision on money laundering in Azerbaijan, approximately worded as follows: “Large-scale money laundering processes have taken place in Azerbaijan over the last few years, which aim to influence the PACE delegates and reporters in order to prevent the criticism against Azerbaijan”. For over a century, no matter what evidence is presented to the Turkish government about their guilt as perpetrators of the Armenian Genocide, they always claim it is fake and deny the facts. Similarly, despite all evidence presented to Azeri leaders about their misuse of billions of dollars for bribery and corrupt practices, they always deny the facts and blame Armenians, other countries and certain individuals who are supposed to be against them! Last week was no exception. The Guardian and dozens of newspapers around the world reported that the Azeri government had paid around $3 billion in bribery to many individuals and institutions throughout Europe from 2012-2014. The Guardian reported that there were more than 16,000 such transactions. In this major scandal, not only the Azeri government is guilty of corruption, but also all those European officials who took the bribe to carry out illegal favors for the Aliyev regime! What the Guardian describes as ‘the Azeri Laundromat,’ involves “a scheme to curry influence, pay lobbyists, apologists and European politicians to launder cash [which] comes from companies linked to Azerbaijan’s president, Ilham Aliyev, state ministries and the International Bank of Azerbaijan, the country’s largest bank, which recently filed for bankruptcy protection. The cash was transferred from four offshore-managed UK companies. From there it was spent in various countries, including Germany, the UK, France, Turkey, Iran and Kazakhstan.” The Guardian forgot to add Belgium and Italy! The illegal Azeri money was funneled to four UK companies through a small branch in Estonia of Danske, Denmark’s largest bank. Two of these shadowy offshore companies were Scottish limited partnerships, Hilux Services and Polux Management, overseen by agents in the British Virgin Islands. There are also several high-ranking Azeri officials who benefited from these funds. One Azeri firm -- Baktelekom MMC -- paid more than $1.4 billion into offshore bank accounts. Interestingly, it was also revealed by a Hungarian newspaper that at the time Hungary extradited Ramil Safarov, the Azeri ax-murderer of an Armenian soldier during NATO exercises in Budapest in 2004, Azerbaijan made several bank transfers totaling $7 million to the Hungarian bank MKB. This is yet another example of Azerbaijan’s corrupt use of secret slush funds to gain favors in Europe and elsewhere. 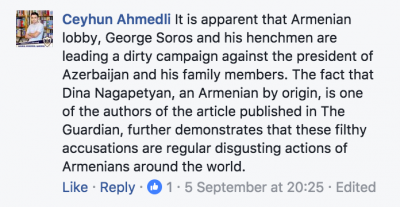 The Azeris, of course, would not admit their wrongdoing and blamed everyone from Armenians to billionaire George Soros, and the international media. “Azerbaijan’s presidential aide, Ali Hasanov, said the stories by the Guardian and other media partners were a smear…. Hasanov said the regime was the victim of a ‘scandalous’ campaign organized by British intelligence, the Armenian diaspora and the U.S,” according to the Guardian. Hasanov blamed certain anti-Azerbaijan circles who are “controlled by the funds of the Armenian diaspora in the West, in particular the U.S.” Furthermore, the Azeri government blocked access to the website of the Organized Crime and Corruption Reporting Project (OCCRP) which had published the details of the ‘Azerbaijani Laundromat,’ following a leak of data to the Danish newspaper Berlingske. UK Prime Minister Theresa May announced last week that the National Crime Agency will investigate the corrupt practices of the four UK companies linked to Azerbaijan. Also, several members of the Parliamentary Assembly of the Council of Europe intend to expand the existing investigation of Azerbaijan’s persistent corruption schemes. To me this is just a window dressing, nothing will come out of it! The European Parliament has called for an investigation into revelations by the Guardian and media partners that Azerbaijan ran a secret $2.9bn (£2.2bn) slush fund to pay influential Europeans to paint a positive image of the authoritarian regime, The Guardian reported laundromat. According to the source, MEPs have demanded a “comprehensive” investigation into “attempts by Azerbaijan and other autocratic regimes ... to influence European decision-makers through illicit means”, following a last-minute amendment to a report on corruption. In a separate move, the head of the Council of Europe, Thorbjørn Jagland, called for unprecedented legal action against Azerbaijan over its refusal to release a political prisoner in defiance of the European court on human rights. The Council of Europe and ECHR are not part of the EU, but the coincidence in timing shows how political repression and corruption in Azerbaijan is rising up the agenda of Europe’s institutions, the newspaper writes. At a meeting of Council of Europe ambassadors on Wednesday, Jagland called for the launch of legal proceedings against Azerbaijan for flouting ECHR court judgments – an unprecedented step in the 68-year history of the Council of Europe. Jagland wants to invoke the Council of Europe convention’s article 46.4, which could ultimately lead to Azerbaijan being ejected from the human rights body. This “nuclear option” has never been used before and would require action from European foreign ministers, following a court assessment. The paper remind that the politics of the oil-rich country were also being debated in the European parliament, when MEPs voted to set up a corruption investigation by 349 votes to 290, with 42 abstentions. “Following the recent ‘Azerbaijani Laundromat’ https://www.theguard...jani-laundromatrevelations, attempts by Azerbaijan and other autocratic regimes in third countries to influence European decision-makers through illicit means [the European parliament] calls for a comprehensive parliament investigation,” the text stated. BRUSSELS—The recent “Azerbaijani Laundromat” revelations should be investigated and the “Magnitsky” sanctions list adopted by the EU, Members of European Parliament (MEP) urged on Sept. 15. MEPs condemn the recent revelations, “attempts by Azerbaijan and other autocratic regimes in third countries to influence European decision-makers through illicit means,” in a resolution approved by 578 votes, to 19, with 68 abstentions. They also called for the European Parliament to investigate and adopt robust measures to prevent such corruption occurring. Corruption is “one of the most neglected causes of human rights violations” and the European Union should foster international cooperation to fight it, urged the MEPs. They called on the EU to ensure that existing anti-corruption conventions are enforced; add an anti-corruption clause to its deals with non-EU countries; monitor EU-funded projects closely and permanently, in cooperation with local anti-corruption agencies; as a last resort, use sanctions or suspend deals in cases of systemic corruption leading to serious human rights breaches; support and protect independent media, civil society organizations and whistle-blowers who expose corruption cases, despite risks of reprisals; bring the “Magnitsky” sanctions list against the 32 Russian state officials responsible for the death of Russian whistle-blower Sergei Magnitsky to the Council as soon as possible for its adoption, and impose targeted sanctions against these officials. With Lux Leaks, Panama Leaks, Russia and Azerbaijan Laundromats, we realize that corruption stretches far across state borders, and has dramatic repercussions on policy decisions,” said Lithuanian politician, and MEP Petras Auštrevičius. “Through this report, we call for the highest possible ethical and transparency standards to be upheld in international and national bodies and for the EU to set up a legal framework to deter any type of corruption and fraud.” Auštrevičius added. An in-depth investigation led by the Organized Crime and Corruption Reporting Project (OCCRP) revealed on Sept. 5 that Azerbaijan’s ruling elite operated a secret $2.9 billion scheme to pay European decision-makers, purchase luxury goods, and launder funds through a network of British companies. Azerbaijan’s leadership made more than 16,000 covert payments between 2012 and 2014, according to the information presented. 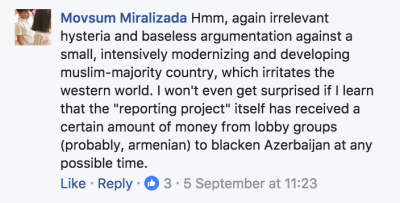 Some of the money was given to lawmakers, politicians, and journalists as part of an international lobbying mission to deflect criticism of Azerbaijani President Ilham Aliyev and to portray Azerbaijan in a positive light. The investigation also revealed that that several bank transfers—in excess of $7 million—were made to a Budapest bank account around the time the Hungarian government extradited Azerbaijani ax-murderer Ramil Safarov to Azerbaijan. As part of the ongoing investigation into the “Azerbaijani Laundromat“—a nearly $3 billion slush fund tied to Azerbaijan’s ruling elite and used to buy influence around the world—Hungarian investigative journalism NGO Átlátszó.hu revealed that the Budapest bank account belonged to an offshore company owned by the son of an influential Azerbaijani politician. According to the report, more than $7 million was transferred to the account in 2012 right around the time the Hungarian government struck its deal with Azerbaijani authorities, allowing for Safarov’s extradition. The offshore company has since been closed. Ramil Safarov, the Azerbaijani army officer who was serving a life sentence in Hungary for axing to death Armenian Lt. Gurgen Margaryan, was extradited to Azerbaijan on Aug. 31 and pardoned by Azerbaijani President Ilham Aliyev. reveal what money is the talk about, and to whom it was given. in Armenia during these days. members is scheduled in spring. British Petroleum and Socar have extended the agreement signed between them in 1994 until 2050. Initially, the end date of the agreement was 2024. In fact, it has been extended for another 26 years. BP is a consortium in which the Azerbaijani Socar has a share which has been increased from 11.7% to 25% which has been hailed by Aliyev. He noted that Baku will get an additional 3.5 billion dollars. This money is important for Azerbaijan considering the financial issues that there are in the banking system of this country. A few months ago the Western press reported a possibility of default in one of the major banks in Azerbaijan. In this respect, Azerbaijan gains an important financial source. On the other hand, the new agreement is interesting against the corruption scandal involving Aliyev revealed in the international press, namely the Guardian. Moreover, Baku blamed not only the Armenian lobby for the scandal as it traditionally does but also the British special services. And now, a few days after the latest corruption scandal the agreement is signed which extends the term of the authority of BP consortium over Azerbaijan’s oil resources by another 26 years, until 2050. Now it is clear why Baku hinted that the British special service backs the next international scandal. Had Baku refused to extend the agreement with BP until 2050 or was it trying to set its own conditions. What was the initial issue before the international corruption scandal and what was the solution is confidential but interestingly the agreement between Azerbaijan and BP was prolonged immediately after the corruption scandal. It is also interesting that this time the corruption scandal involved one of the companies of the Russian defense industry, Rosoboronexport. It is possible that Azerbaijan was planning to sign an oil agreement with Russia, not BP or Moscow was trying to strike a deal with Baku. Azerbaijan practically surrendered, even if it got an additional 3.5 billion dollars. The point is that the presence of a Western consortium in the Azerbaijani oil and gas sector is an indirect but quite specific mechanism of stability and security in the Caucasus because only in such setting is the smooth flow of oil money possible. One should not underestimate the role of oil interest of the West in Baku in the relative stability of the process of the Karabakh conflict in the past two decades. In fact, currently this interest is prolonged by another 26 years, until 2050. De facto it means extension of the current status quo and relative peace until 2050. Aliyev knew this very well but he was helped to understand what else the water of the “laundromat” could wash away if they disobeyed regarding oil. 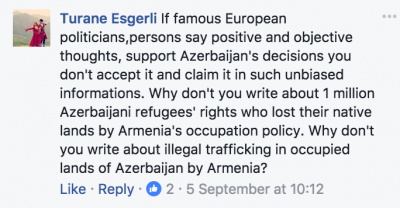 Blogger Alexander Lapshin who was jailed in Azerbaijan for visiting Karabakh and later pardoned by Ilham Aiyev commented on “recognition” of Karabakh as “Azerbaijani terroritory”. He added that Azerbaijanis have unfortunately turned from cultural national of poets and merchants into nervous and revengeful people convinced that “their future depends on Sasha Lapshin”. Lapshin said he could imagine how much Belarus president Alexander Lukashenko got in exchange for something with help of which Azerbaijan spoiled relations with Armenia and Russia, let alone Israel. “And this because of a blogger. That's where the money from the Caspian oil is plunging, while the people are begging for $ 100-150 a month,” he wrote. Where is the money? Show me the money!!!!!! Today's politicians vocabulary. Revelations over payments by Azerbaijan to European politicians have seeped into the German election as it emerged that a close ally of Angela Merkel allegedly received money from the authoritarian regime, The Guardian reports. According to the Süddeutsche Zeitung , Strenz was paid between €7,000 and €15,000 (£6,000-£13,000) sent to her via a firm set up by Eduard Lintner, a former German MP and lobbyist for Azerbaijan. The Guardian said Strenz has refused to comment and did not respond to emails. The scandal threatens to shake up what has so far been a sleepy election campaign, lacking any of the personal mudslinging or scandal-ridden offensives typical of the US or Britain, with Merkel’s CDU on course to secure victory. Latest polls show it to be on 36% – 14 points ahead of the party’s nearest rival, the Social Democrats. Lintner was one of several prominent Europeans to have received large sums of money from a scheme nicknamed the Azerbaijani Laundromat, exposed this month by the Guardian and other media partners. Lintner admits the payments but says he did not personally benefit and he was unaware of the original source of the payments. Azerbaijan’s ruling elite used the $2.9bn (£2.1bn) fund to silence criticism of the country’s dismal human rights record with a series of under-the-table payments made to leading European politicians. Leaked banking data shows that Lintner received more than €800,000 through UK shell companies. Some of this money was paid to other parliamentarians in Germany and Belgium. The payments to Strenz in 2014 and 2015 were sent through Lintner’s company, Line M-Trade, based at the office of his Nuremberg lawyer. Strenz has visited Azerbaijan on several occasions, including as an election monitor, and is chairwoman of the German-South Caucasian Friendship Group. She has posted a photograph on her website – slogan “Politics can be different” – with Azerbaijan’s authoritarian leader, Ilham Aliyev. Strenz, a former teacher, has been a member of parliament since 2009. She is now under pressure to explain whether the payments may have influenced her voting record in Berlin and in the Council of Europe, where she is a member of the parliamentary assembly. In June 2015, Strenz voted against a parliamentary assembly motion calling on Azerbaijan to release its political prisoners, who include several journalists. She was the only German representative who voted no. Strenz has given an approving verdict on Azerbaijan’s elections, in contrast to other observers who have been critical.